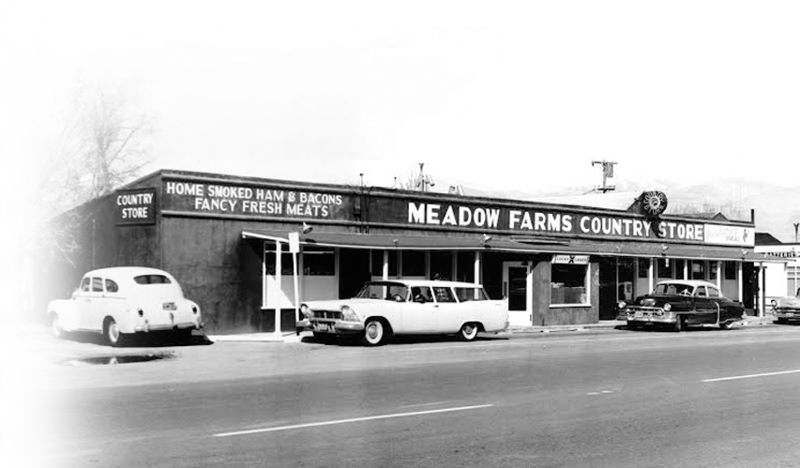 It was a man called "Wally" who named this store and area "Meadow Farms," back around 1922. He started the business of smoking hams and bacon with 300-year-old mountain mahogany logs just for the local folks. The mahogany smoked taste was an immediate success and thanks to the many tourists in this beautiful High-Sierra country, the word traveled. Originally the store was only 45' long with a 10' meat case and Wally lived in the back room. As the building expanded, it housed a church, a grocery store, a bar, an antique shop, and a bakery. Due to all the changes and transitions, the ham and bacon business hung on. Today while the meat case is only 20' long, the Mahogany Smoked Meats that pass through it have become nationally famous. We carry a top quality product smoked long and deep with mahogany logs, including a taste that is out of this world because of the rich aroma of the mahogany smoking. We smoke with mahogany logs that have already fallen before we are allowed to take them. Mahogany is about 7 times heavier than hickory and is so dense and heavy, it sinks in water. The taste and aroma that mahogany produces is what made this little smokehouse famous. You can buy those "run of the mill" hickory smoked products in just about any store in this Country, but only here in Bishop will you find the unique gourmet flavor of our mahogany smoked meats. While visiting the beautiful high sierra's stop by and say hello. We're known for our generous samples and if you visit us on any weekend you'll likely find us cooking some of our famous mahogany smoked bacon. Believe us when we say that the aroma will stir your appetite!